The English Springer Spaniel is a dog breed originally bred as a hunting dog to retrieve shot live games. It is one of the many Spaniel breeds. 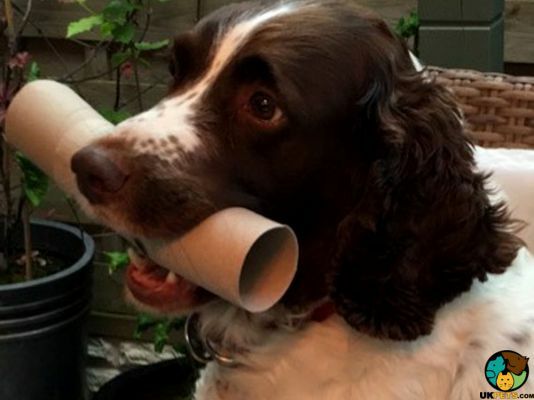 English springers are smart and happy dogs. Coat colours range from brown, white, black and white or with tan spots. 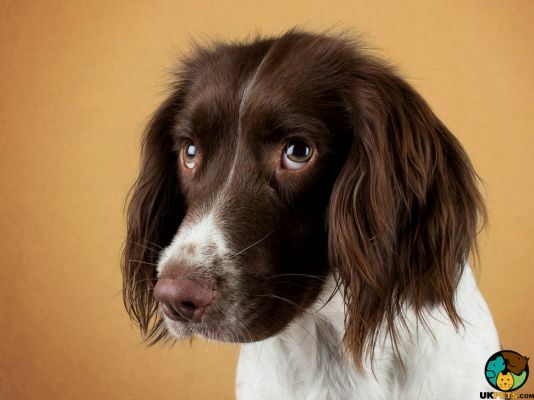 They also look similar to their Spaniel cousins, the Welsh Springer Spaniel and the Cocker Spaniel. 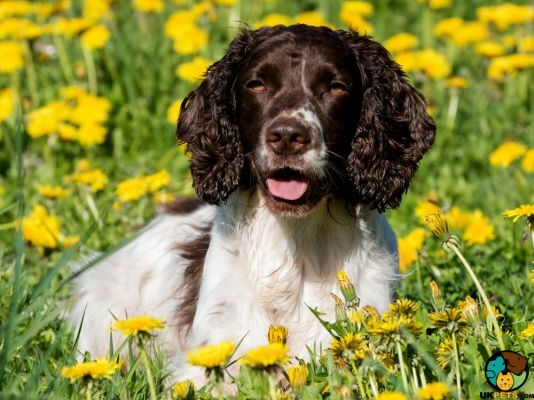 Are you thinking of getting an English Springer Spaniel? Here is a brief background of this agile and affectionate pedigree dog. Spaniel-type dogs were bred in the 17th century, which are believed to have come from Spain. These dogs were used for flushing games to “spring” into the air. After their work, they came home with their owners as companions. During the 19th century, these dogs were divided according to size. Those weighing 25 pounds were called Cockers Spaniels and used to hunt woodcock. “Springing” larger game became the task of the heavier 45-pounder spaniels. Thus, the name English Springer Spaniels. The English Springer Spaniel was recognised by the Kennel Club in 1902 and by the American Kennel Club in 1910. 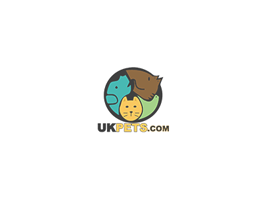 Since 2008, the breed has been one of the most popular breeds in the UK. The English Springer Spaniel is a compact, well-proportioned and strong pooch. It weighs 44 to 55 pounds and stand 43 to 51 centimetres at the withers. Like most Spaniels, it has the usual gentle and intelligent expression. 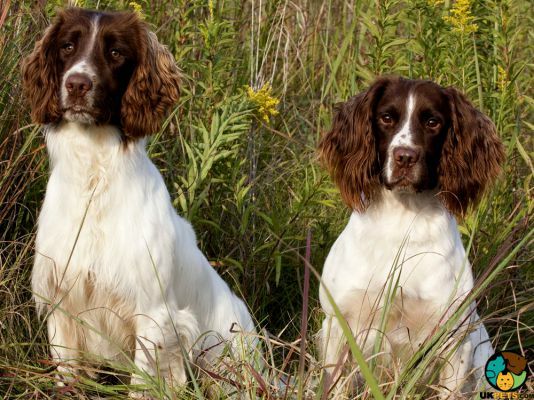 There are essentially two types Spaniels: those bred for show and those who work in the field. There are a few clear differences in terms of appearance. Show types are prized for their beauty and showmanship, and boast of longer and softer coats. They have longer flews and are known for their distinctive dewlaps. Field types have shorter ears, pointier noses and are leaner because they were bred as athletes. Both Springers have rounded heads, broad necks and strong jaws. Their weather-resistant coat is straight, soft and close-lying. 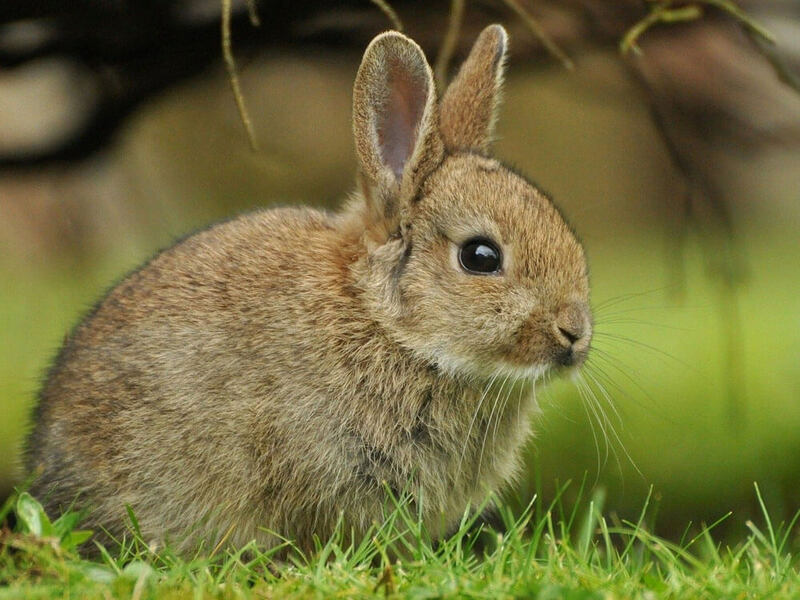 There is slight feathering on their ears, chest, legs and belly. They come in black and white, liver and white, or either of these colour combinations with tan markings. Springers have demanding grooming needs. They need to be regularly brushed to prevent tangles and mats. Their head, ears, neck, tail, and feet need to be trimmed to maintain their neat appearance. Bathing can be done once every three months. Professional grooming is encouraged at least three times a year to maintain a shiny and healthy coat. Since air could not circulate properly in their heavy ears, check for signs of wax build up and infection. 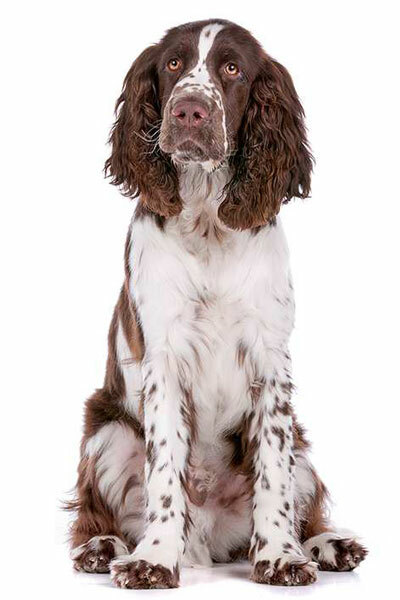 The English Springer Spaniel is smart, loyal, even-tempered, and versatile. It is people-oriented so aside from enjoying its owner’s attention, it will also seek affection from other people, even strangers. This breed may bark at noises and outsiders but it is not necessarily a guard dog. It is generally a happy dog that gets along with everybody including children and other pets. However, keep in mind that it might consider birds as prey since it was bred to hunt them. With its strong desire to be with people, it has separation anxiety and becomes noisy or destructive when left alone. Because Springers are intelligent and eager to please, training is reasonably easy. Early socialisation is important because some can become timid when not exposed to other people and pets. Before getting a Springer, make sure you know the difference between the two and choose what suits your lifestyle. Field types are more energetic so they require more physical activities. Show Springers can also hunt but are slower because they are heavier. Then again, not all dog breeds exhibit the same behaviour regardless if the breed is predisposed to certain breed qualities. Each dog is unique, and several factors contribute to shaping their personality. A typical serving for an adult English Springer Spaniel is 1.5 to 2 cups of excellent quality dry dog food per day. As a dog originally bred to work, it has high energy and nutrient requirements. Nonetheless, you have to consider its age, size, build, activity level, and metabolism when deciding meal quantity and frequency. You also need to understand the individual needs of your dog. 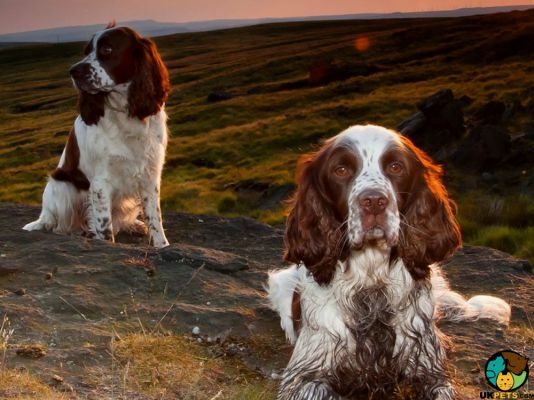 English Springers require more protein and less carbohydrates to be able to sustain their energy needs. Protein is great in providing essential nutrients to build muscles. Like any breed, English Springers need a complex range of nutrients, which includes a healthy foundation of vitamins, minerals and antioxiadants. Breed experts believe that they need a diet rich in B Vitamins to promote better reflexes. This vitamin is also good for the nervous system, eyes and hair. Incorporate Glucosamine, Omega 3 Fatty Acids, Vitamin E, and Vitamin C to prevent Hip Dysplasia. It is advised to feed them whole foods consisting mainly of meat such as chicken, lamb, fish, and turkey. Carrots, blueberries and eggs are also recommended to promote better eyesight. Avoid grain, especially wheat, soy and corn, which are used as unhealthy fillers in commercial dog food. 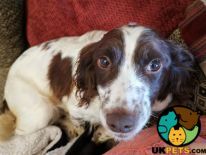 English Springers are generally healthy but predisposed to certain medical conditions such as ear infections, auto immune diseases and skin disorders. It can also acquire Fucosidosis, Hip Dsyplasia, Epilepsy, PFK - Phosphofructokinase deficiency. Eye disorders such as Hereditary Eye Disease, Progressive Retinol Atrophy (PRA), Primary Glaucoma, Entropion, and Retinal Dsyplasia are pretty common. 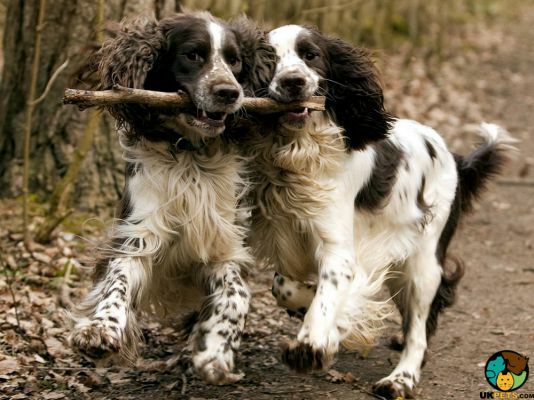 As active dogs that were bred as hunters, adult Springers require at least 2 hours of exercise daily. Field Springers have higher exercise needs than Show Springers. They enjoy long walks and runs a few times per day. They also enjoy playing freely or performing retrieving and agility drills in a fenced yard or in farms and ranches. Consult a Vet for FREE. Getting a dog requires a financial commitment to its health and well-being. The English Springer Spaniel can cost around £300 - £1500 if purchased from a reputable breeder. When it comes to food, this dog breed can cost anything from £50 - £60 a month on high-quality dog food. Considering everything you will need to purchase or avail for an English Springer Spaniel (e.g. toys, accessories, grooming), you will most likely need to shell out £90 - £120 monthly, excluding vet bills for health issues. Overall, having a pet dog is a rewarding experience, although it can also prove to be costly. Is an English Springer Spaniel Right for You? The English Springer Spaniel is a sturdy medium-sized dog. It has long and soft coats with demanding grooming needs. It is a highly intelligent and eager-to-please pet. The English Springer requires mental and physical stimulation. It requires a higher level of training, so they’re ideal to experienced dog owners. Its suffers from separation anxiety if left alone too long.